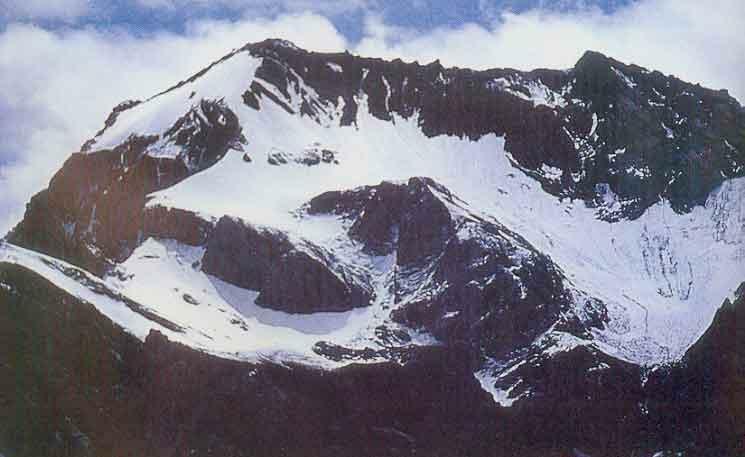 Popularly known as Chotta Kailash it in many ways is the replica of the famous Mt. Kailash in Tibet. 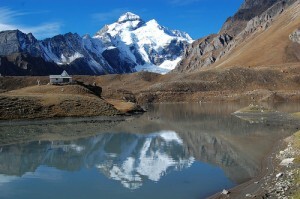 Located in Indian Territory close to the Indo- Tibetan border, it is an area of great natural beauty, peace and serenity. With the roar of urban life receding to the background one finds the healing quietude of this region conducive enough to turn inward and be one’s own listener. At the very foot of Chotta Kailash is Gauri kund reflecting its entire expanse. Yet another water body close by is called Parvati Sarovar. Also known as ‘Mansarovar’ it is much smaller than the original one. A temple dedicated to Shiva and Parvati is there at the shoreline. Following the Chinese occupation of Tibet Chotta Kailash served as the most revered substitute of Mount kailash. From Gunji the kailash Mansarover route branches off to Kalapani from where the Kali river originates. Onwards from here is Navidhang (3987m) Lipupass is only 9kms from here. From Navidhang “Aum Parvat” ,the miracle of nature is clearly perceptible. Snow lies on this mountain in the shape of a perpetual “Aum”, the primordial sound. All other slopes may be bare but this inscription in snow is everlasting and as one observes it, one gets the feeling that the mountain itself is Lord Shiva incarnate. No hypothesis, no assumption and no imagination are ever required to visualize this “Aum” sprawled on the mountain slope since time immemorial. Passing through the beautiful valleys of Beans, Chaundas and Darma one encounters in this region different and ever changing moods of snow covered mountains, beautiful rivers, towering peaks and tradition villages like Gala, Garbiyang, Budhi, Gunji, Napalchu Navi, Rongcong and Kutti inhabited by the Rang tribals of Shauka origin. It indeed is an exciting trekking region. Not only does one walk here along a large portion of the- Kailash Mansarovar route, one often feels this physical experience transpiring into a spiritual experience of lasting consequences. Adi-Kailash yatra is able to transfer your physical journey into a spiritual experience, a journey in search of truth . Starts At: Tour starts from Delhi- Tawaghat (By bus) Chotta Kailash (Trek) and back. In this very exciting trekking region, one not only walks along a large portion of the Kailas – Mansarovar route, but also gets to know and understand the social and cultural life of the people living in the Chaudans, Byans and Darma valleys. The journey begins and ends at Tawaghat, the confluence of the river Kali and Dhauli E. in district Pithoragarh. The trekker can go to Kalapani and come back to Gunji in the evening. From Gunji, walk along the banks of the river Kuti, to reach Nabi, which has a temple and almost hidden spring in the beautiful mountain standing behind the village. In many places, the river Kuti is completely covered by snow. 11 Km ahead is the PWD hut at Nampha from where the view is as breathtaking as it is Kashmir and the Swiss Alps. Walk 14 Km, first to the left of Kuti and then to the right, to reach Jonglingkang (4572m). The river Kuti and its bridge will probably be under a thick blanket of snow. Jonglingkang is called Chhota Kailas (6191m) while its small but beautiful lake is called Parvati Tal. The reflection of the peak in the lake is really fascinating. Gunji/ Budhi (17Kms by trek) . Inclusive of Accommodation, Transport, Food (Vegetarian), Guide charges, Transport for luggage upto 20Kg per Yatri. NOTE: On the day of reporting at Delhi (Day 1) and arrival in evening at Delhi after the completion of Yatra (Day 20) only share accommodation will be provided by KMVN. 1. 15 days before departure no refund. 2. 20 days before departure 60% deduction. 3. 25 days before departure 40% deduction. If you have not decided yet or wants to customize tour itinerary or hotels listed above in "20 Days Trekking Package to Adi Kailash by KMVN Rs.21000/-", then we can change the travel itinerary and make a personalized, tailor-made holiday package, especially for you. We can modify this travel package as per your itinerary, budget, duration and the tourist places you would like to visit, including transportation and airfare should be included or not. Please fill the form below to contact us. dear sir, i’m interested in the Adi Kailash trek in september. Is it possible to do this trek and what are the costs per person? And what is included?